Quadratus lumborum is a quadrilateral muscle which occupies the medial half of the gap in the middle of the 12th rib, the iliac crest, along with the apices of transverse processes of lumbar vertebrae. The quadratus lumborum muscle is enveloped in the middle of the anterior as well as middle coatings of the thoracolumbar fascia. The transverse process of vertebra LV. The neighboring portion of the iliac crest. In order to be inserted into the medial part of the anterior surface of the 12th rib, the muscle fibers travel upward as well as medially, run posterior towards the lateral arcuate ligament. It is also inserted posterior towards its bands of origin, inside the upper lumbar transverse processes. Laterally, on both sides of the vertebral column the quadratus lumborum muscles occupy the space in the middle of rib XII along with the iliac crest. They are covered medially via the psoas major muscles. The transversus abdominis muscles are adjacent to their lateral borders. The muscle attaches superiorly towards the transverse process of the first four lumbar vertebrae along with the inferior rim of rib XII. It is supplied via ventral rami of T12-L3/L4 lumbar spinal nerves. Palpate the quadratus lumborum with subject either supine or standing. The lateral trunk flexors must be relaxed so that the examiner can place the fingers deep under the erector spinae muscles. The subject should bend the trunk laterally, and then relax. The fingers are placed over the posterior iliac crest and below the 12th rib directed toward the vertebrae. 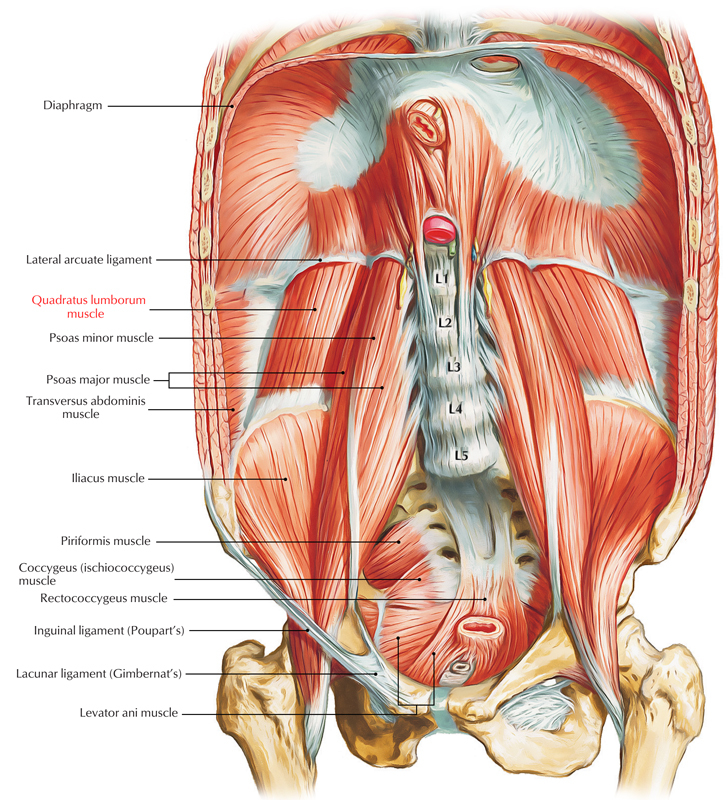 The quadratus lumborum is very deeply located and also creates portion of the posterior abdominal body wall. The majority of the quadratus lumborum is located deep towards the erector spinae. The abdominal viscera are located anteriorly deep towards the quadratus lumborum. The psoas major is located slightly anterior as well as medial towards the quadratus lumborum. The quadratus lumborum is located within the deep front line myofascial meridians and involved with the lateral line. Lateral flexion of vertebral column together with ipsilateral contraction. Extension of lumbar vertebral column together with bilateral contraction. Fixes the 12th rib during forced expiration. It assists the diaphragm in inhalation. 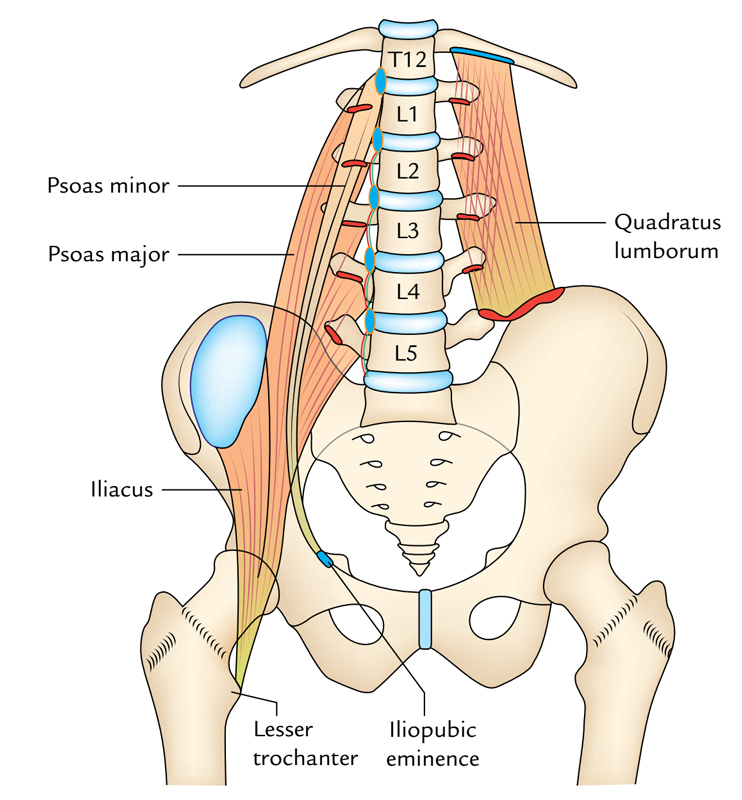 In an oblique plane, the quadratus lumborum has one track of draw upon the pelvis and therefore creates one motion, which is a mixture of elevation and anterior slant of the pelvis at the lumbosacral joint along with lateral flexion as well as expansion of the lower lumbar spine in relation to the upper lumbar spine. In an oblique plane, the quadratus lumborum has one line of pull in relation to its reverse action draw on the trunk, therefore makes one motion, which is a mixture of lateral flexion as well as extension of the lumbar spine along with depression of the twelfth rib. Restrains same-side depression along with posterior tilt of the pelvis. Restrains flexion as well as opposite-side lateral flexion of the trunk. Restrains elevation of the twelfth rib. Balancing the pelvis, lumbar spinal joints, as well as the twelfth rib. Balancing of the twelfth rib is main role of the quadratus lumborum. The quadratus lumborum’s force of recession of the twelfth rib balances the twelfth rib from elevating whenever the diaphragm narrows and draws superiorly over it. Due to over exertion, stress, and strain, pain in the quadratus lumborum can appear. When they’re weak or too tight, from time to time muscles initiate pain and rigidity. Specifically in the quadratus lumborum and neighboring zones, activities such as sitting for long time can decrease blood flow towards an area. Recurring motions and weak back muscles, which lead to poor posture, can also initiate pain. As a result of accidents as well as inadequate leg measurements, pain can also exist in this zone. More tension is created by all of these causes which can make you rotate, turn, or lift inadequately. If it has to overcompensate in order to stabilize spine and pelvis, it can also lead to quadratus lumborum becoming excessively constricted.